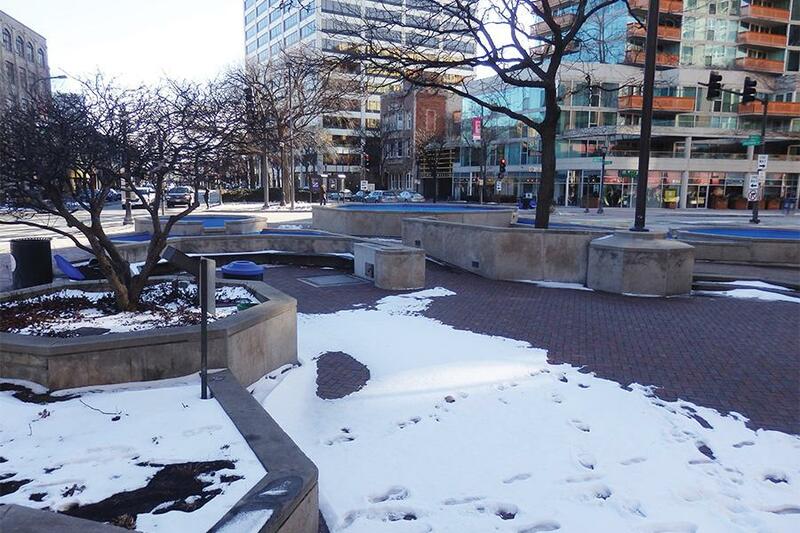 Renovations to Evanston’s Fountain Square, the existing structure of which was set in 1976, are expected to begin sometime in 2017. Christopher B. Burke Engineering, Ltd. will serve as the engineering firm for the renovations. Renovations to Fountain Square will begin next year after initial funding for the project was approved by City Council last week. The square, which is located at the intersection of Sherman Avenue, Orrington Avenue and Davis Street, is currently home to a fountain, which is fairly old and beginning to deteriorate, city officials said. The renovations would likely replace the fountain and rearrange the space, which also includes a veterans memorial, said Lara Biggs, Evanston’s capital planning bureau chief. Renovations may extend to the landscaped area across Davis Street south of Fountain Square and to the intersection itself. The team putting together the proposed changes to Fountain Square will allow time for public input in the coming months and hopes to have a finalized plan by late summer, Biggs said. Construction will likely begin in 2017 and may occur in two phases, depending on the final plans. Biggs said the city had just started planning the project, and although they were not sure what the final price tag would be, she estimated the cost would be between $4 million and $5 million. The city is planning to finance renovations to Fountain Square using Tax Increment Funds, which is money collected through taxes by the city to be used for public works. Biggs said the final proposal would depend on how much TIF funding they are able to utilize. A memorandum issued to City Council for the Feb. 22 meeting said the renovations could include a new fountain, seating area and lighting, as well as a possible enlargement of the traffic island in the 1500 block of Sherman Avenue and Orrington Avenue. There will also likely be repairs to the water main line in the 1600 block of Sherman Avenue. The roadway between Church Street and Davis Street may also be repaved. “Anytime you replace a critical feature like a fountain, it is worth looking at the surrounding area to make it all an area that flows together and works as one installation,” she said. Annie Coakley, executive director of Downtown Evanston, an organization that helps with marketing and management assistance for downtown businesses, said she hopes the renovated square will provide a space for people to grab lunch with friends and for larger community gatherings. She also said she hopes the space will become more accessible year-round. “Obviously it’s a fountain and we’re in the middle of a midwest winter and we can’t have flowing water there, but (we asked ourselves) could it have an element that could still have an activated purpose in the winter months?” she said. Downtown Evanston was part of the team that selected Christopher B. Burke Engineering, Ltd to help the city plan the renovations and Coakley said Downtown Evanston would help businesses surrounding the square deal with any negative impacts next year’s construction might have. Coakley said infrastructure repairs are just what comes along with older city amenities, but she is excited for the project. Tags: Annie Coakley, Christopher B Burke Engineering, Downtown Evanston, Fountain Square, Lara Biggs, Lauren Duquette, Ltd.